It was their joint feast day yesterday. There is some really fascinating stuff about the feast and its history in the Blessed Cardinal Schuster's Liber Sacramentorum which I had hoped to put up yesterday. But in the end it was too much of a good thing and not enough time. Puttering about in the nascent garden took a longer than expected (at the moment much of it is a swath of dirt - hard packed California adobe brick dirt) and time for the Monday advanced class arrived before I knew it. No time left for the blogification of the sanctoral cycle. But as today is St Paul's day there is some nice stuff about this day which I hope to put up. It's a bit shorter and it looks like I'll have some time this evening. I've a funeral to do later this afternoon which should warm up the fingers for some industrious touch-typing in the evening. Grant, we beseech Thee, O Lord, that the world may be regulated in its course by Thy governance for our peace, and that Thy Church may with tranquil devotion rejoice. Through Our Lord. Here is Jim McGillivray on the Scottish small pipes using a D chanter playing The Apprenctice Lads of Alnwick and Go to Berwick, Johnny. A lovely pair of border tunes, brilliantly executed. Especially if you don't look too closely. I did a quick double-take this afternoon when I glanced at the market closing reports. 1314 - not just another great John Drewry dance (128 bar strathspey and reel medley, with Schiehallion reels -- but you knew that) but also the year in which the battle of Bannockburn occurred on the 24th of June. Tea at Trianon has a timely post here. The fort is betrayed even of them that should have defended it. 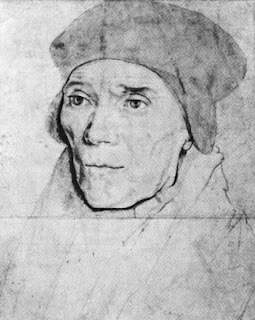 In the Pauline Rite and in some places in the traditional Roman Rite today is the feast of St John Fisher, the cardinal bishop of Rochester. It's also the feast day of St Alban, the first English martyr. St John shares the festal celebration with St Thomas More who joined him in opposing the king's attempts to withdraw England from the Catholic faith. There is a bit more on these three martyrs here with some useful links. 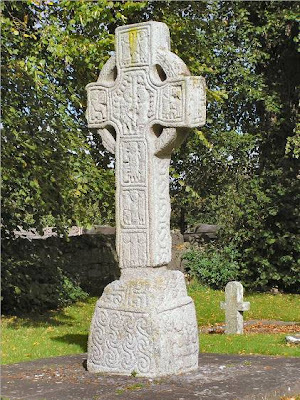 This is one of the high crosses of Castledermot in County Kildare. (You'll find this one and several other excellent photographs - quite large and with good detail when you click on them - at this site.) Why high crosses? Well, today is the feast day of St Diarmuid who founded the ancient monastery where they are located and after whom Castledermot is named. St Diarmuid founded the monastery in 818 only 5 years before his death in 823. Short though his abbacy was, he brought great prestige to the foundation as it became a burial place for several kings. This weekend marks the first day of summer. So herewith, "Sumer is Ycomen In" played by some border pipes, medieval pipes, Scottish small pipes, a couple of Cornish double chanter pipes, a Leicestershire small pipe, a bass clarinet (or two? )and heaven knows what else. And as the person who cited me to this performance says, they do manage to pull it off. 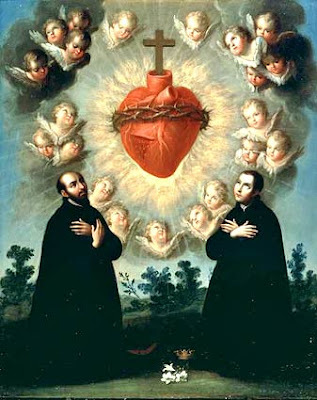 Today is the feast of the Sacred Heart of Jesus in both the Roman and the Pauline calendars. The reliable old Catholic Encyclopædia goes into great detail on the history and theology of the devotion here. EWTN provides the text of some devotions here. And while you're there, you'll find some devotions for the Immaculate Heart of Mary also since in the Pauline Rite it's her feast day tomorrow. O, Sweet Jesus, whose overflowing charity for men is requited by so much forgetfulness, negligence, and contempt, behold us prostrate before Thine altar eager to repair by a special act of homage the cruel indifference and injuries to which Thy Loving Heart is everywhere subject. Mindful alas! that we ourselves have had a share in such great indignities, which we deplore from the depths of our hearts, we humbly ask Thy pardon and declare our readiness to atone, by voluntary expiation not only for our own personal offenses, but also for the sins of those, who, straying far from the path of salvation, refuse in their obstinate infidelity to follow Thee, their Shepherd and Leader, or, renouncing the vows of their baptism, have cast off the sweet yoke of Thy law. We are now resolved to expiate each and every deplorable outrage committed against Thee; we are determined to make amends for the manifold offenses against Christian modesty in unbecoming dress and behavior, for all the foul seductions laid to ensnare the feet of the innocent, for the frequent violations of Sundays and holy days, and the shocking blasphemies uttered against Thee and Thy saints. We wish also to make amends for the insults to which Thy Vicar on earth and Thy priests are subjected, for the profanation, by conscious neglect or terrible acts of sacrilege, of the very Sacrament of Thy Divine Love; and lastly for the public crimes of nations who resist the rights and the teaching authority of the Church which thou hast founded. Would, O Divine Jesus, that we were able to wash away such abominations with our blood. We now offer, in reparation for these violations of Thy Divine Honor, the satisfaction Thou didst once make to Thy Eternal Father on the cross and which Thou dost continue to renew daily on our altars; we offer it in union with the acts of atonement of Thy Virgin Mother and all the saints and of the pious faithful on earth; and we sincerely promise to make recompense as far as we can, with the help of Thy grace, for all neglect of Thy great love and for the sins we and others have committed in the past. Henceforth, we will live a life of unwavering faith, of purity of conduct, of perfect observance of the precepts of the Gospel and especially that of charity. We promise to the best of our power to prevent others from offending Thee and to bring as many as possible to follow Thee. O loving Jesus, through the intercession of the Blessed Virgin Mary, our model in reparation, deign to receive the voluntary offering we make of this act of expiation; and by the crowning gift of perseverance keep us faithful unto death in our duty and the allegiance we owe to Thee so that we may all one day come to that happy home, where Thou, with the Father and the Holy Ghost, livest and reignest God, world without end. Amen. The feast seems to be getting more popular. The noon Mass I attended today was SRO. "Mobs and tumults in the streets"
Our nearby city of Los Angeles apparently has a group of freakishly tall men who earn millions and millions of dollars by donning gaily coloured satin underwear and attempting to put an inflated rubber ball into a hoop more times than some other city's group of freakishly tall men similarly attired. According to this morning's paper, the Los Angeles group was able to do this more times than any other city's group. In celebration of this feat, the local population smashed a lot of windows, set fire to some automobiles, and broke into a neighbourhood shoe store and burnt the stock of shoes. In situations where popular feelings of dissent did surface, pipers were often considered to be somehow inflammatory. The town council in Aberdeen in 1731 felt it necessary to ban Andrew Ferguson, a piper, from playing at night, as this had the effect of raising "mobs and tumults in the streets". "Burgh magistrates or the officers on the ground could be bloodied, beaten and imprisoned by ferocious crowds, rarely comprising less than thirty or forty people, often more, who used stones, clubs, staves, pitchforks and occasionally firearms to obtain their ends ... Such crowds invariably included a drummer or piper." --"Welcome Home My Dearie: Piping in the Scottish Lowlands 1690-1900", Peter Stewart, 2008, pg 23 citing Thomas Johnston's "History of the Working Classes in Scotland". Eliseus the prophet is a principal figure in the Carmelite Order as he was the first disciple of the prophet Elias, the reputed founder of the Order. And today is his feast day. You can find Eliseus in the third and fourth book of Kings in the Douay-Rheims translation of the scripture and in first and second Kings in those editions that use the Protestant book titles. Look here for an abridged version and a bit of commentary. Omnipotens sempiterne Deus, qui in electis prophetis mirabilis prædicaris : præsta, quæsumus; ut, sicut Eliæ spiritum in Propheta tuo Eliseo duplicasti, ita in nobis Spiritus Sancti gratiam, ad virtutum opera exercenda, multiplicare digneris. Per Dominum. Amen. Almighty and eternal God, whose glories were marvelously proclaimed by thy chosen prophets, grant, we beseech thee, that even as thou didst give the double spirit of Elias to thy prophet Eliseus, so thou wilt deign to increase within us the grace of the Holy Spirit to enable us to perform virtuous deeds; through our Lord. Amen. The translation is that of "The Missal According to the Carmelite Rite". Today is the feast of St Colum Cille, also known as Columba, "the apostle of Scotland and the bearer of of culture and Christianity to Iona and Scotland (and indirectly to all of northern England)". Last year's post gives his collect and links to his biography. The first Christian inauguration of a sovereign of record in history and the precedent for the coronation ceremonies of Westminster Abbey, is Colmcille's consecration of Aidan, King of the Irish colony in Scotland. Thus auspiciously he launched the king from whose line came Kenneth MacAlpine crowned at Scone the first Irish king of all Scotland. Malcolm Canmore who in 1093, laid the foundations of the Cathedral of Durham as it now stands; Alexander III, 1249-1286, the last Irish king of Scotland. "It's O.K. -- I don't have anything (that I'm not taking medication for)." So said the pipe sergeant a couple of decades ago as he gave my pipes a blow. And this week "state lawmakers . . . last week debated a bill that would require all schools to sterilize musical wind instruments, like clarinets, flutes, and piccolos, before they are passed from one student to another." The Boston Globe will tell you more here. "The secret richness of patience"
We need to discover "the secret richness of patience. Patience! We know that it is useless to worry and be sad. Sadness does not change a situation, except to increase its pain. Simply take each day as it comes, with its own share of sadness and joy. Do not try to guess what tomorrow will bring and do not fall into fear." -Père Jacques de Jésus, O.C.D. "Funny thing, the same people who don't think gender is important in marriage, think it's vitally important in appointing a supreme court justice." Scotland's only beata: Mother Mary McKillop has a feast day today. Trinity Sunday was first celebrated in England and, if I recall correctly, in the Sarum Rite. Up until the final reform of the Roman Breviary Trinity Sunday was noted for the liturgical recitation of the Athanasian Creed. The Pauline rite deep sixed the old creed. Since it's even less ecumenical than the dreaded Good Friday liturgy of old, it doesn't get much notice at all these days. St Robert of Newminster, whose day is kept today, is one of England's medieval saints. The old Catholic Encyclopædia has a short vita here. In Ireland and Scotland St Colman of Dromore is remembered. There is a little life of him here. John Walsh playing some 6/8 marches. It ends a little abruptly but a lovely performance. Fascinating book review in the WSJ this morning called "A Mogul's Jungle Dream". Early in the last century Henry Ford wanted his own supply of rubber and started a rubber plantation in the Amazon. The book tells the story of his efforts. You can find it here. It was a miserable failure as a business venture. But as a story of head-on cultural crash, it makes a great read. And Ford’s dictates to his employees in the Amazon came to be resented. The Brazilian workers didn’t like being made to eat in company mess halls, where they were fed a diet of oatmeal, canned Michigan peaches and whole wheat bread. They were humiliated to have their living quarters constantly inspected for cleanliness and their bodies inspected for venereal disease. They were angry that U.S. Prohibition was enforced in wet Brazil, where liquor was legal. Ford clashed with the Roman Catholic Church, declining its offer to run Fordlandia’s schools. So when the American managers asked an itinerant Catholic priest to preach against alcohol he replied: “For heaven’s sake, I’m not a Baptist.” And forget the Lambada, or whatever its 1930s predecessors were: In Fordlandia entertainments featured American square dances. There's more on the web, the best site probably this one. But take a look here for a shorter version and here for a few pictures. We reached a new record today. . . a high of 73. It is well-known (in this house, anyway) that our knowledge of modern pop-culture, i.e., the rock stars, actors, celebutantes, and assorted other notables, is extremely lacking. As far as motion pictures go, our familiarity starts petering out in the late 1950's and with a few outstanding exceptions stops dead in 1960. That's a pretty accurate chronological box in which to put most of our pop cultural knowledge. Lately, we've found a new index which confirms our breath-taking ignorance of modernity. Each morning the Press-Telegram prints a little column called "Today's Birthdays". We have found that, in general, we have no idea who anyone younger than 50 is. There are exceptions. Yesterday, for instance, we recognized a little tyke of 42. Can't remember who that was at the moment, but the age sticks in the mind as we haven't gone that low in a few weeks. But today was a new record: cluelessness rang in at 73. A happy birthday to Larry McMurtry, the novelist, who is 73. We have no idea who anyone under 73 on that list is. We are occasionally sorry to find that one of our favourite people is not on the list merely, we suppose, because he is dead. But on the whole, this probably makes it a better index of one's non-integration into pop culture. If Halliwell Hobbes, Dub Taylor, and H.V. Kaltenborn were on the list we might get the mistaken impression that we still knew something about what was going on. Not much chance of that in the current format. It hasn't happened yet, but we expect someday to find ourself whitheringly ignorant of the entire list. Tonight: TCM double feature. 7:00 p.m. PDT "Mr Smith Goes to Washington" followed at 9:15 p.m. PDT "You Can't Take It With You". It's outside the purview of The Jean Arthur TV-Movie Alert Service, but if you have time on your hands, you can drown in the best of the screwball comedy genre tonight. At 5:00 p.m. PDT, TCM also has Claudette Colbert in Frank Capra's "It Happened One Night" and at 11:30 p.m PDT the wonderful "Arsenic and Old Lace". June 1 commemorates Bl John Storey, an English lawyer martyred for the faith, and St Ronan, an Irish missionary honoured chiefly in Brittany and in a little village in Scotland. I mentioned both of them a few years ago here. The basics are the same but a couple of the links are broken. The St Ronan's Tattoo is still a going concern but whatever it was I linked to back in 2003 that was supposed to tell you all about it isn't there any more. Try this link to the St Ronan's Border Games instead.